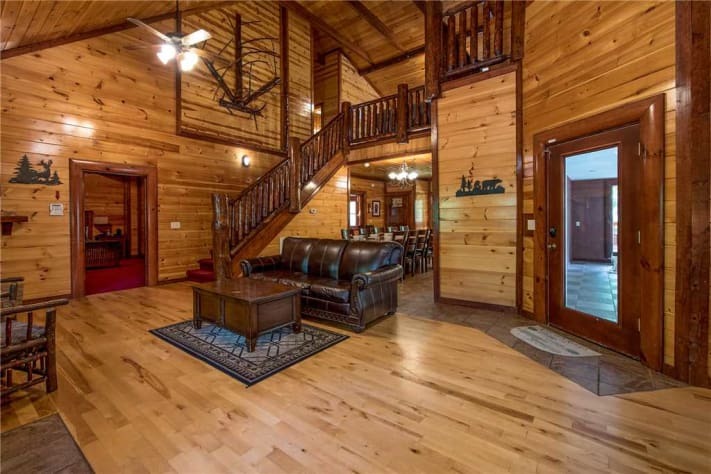 As you enter A New Beginning, you’re sure to be impressed by its indoor pool, its large game room and indoor theater and its large, airy living room. 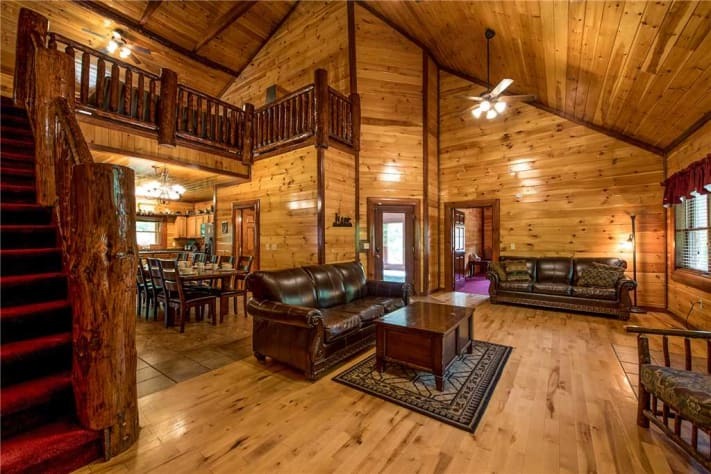 The new wood floor, the wood-planked walls, and the towering cathedral ceiling complement the leather sofas, the cushioned armchairs, and the stone-surrounded fireplace. 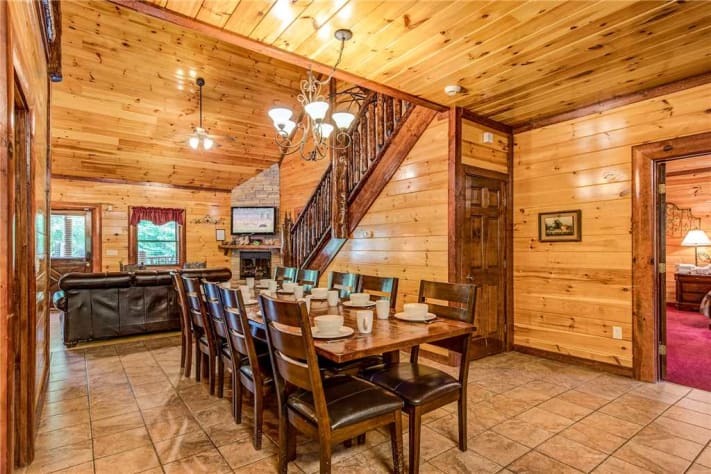 There’s plenty of room for everyone to gather and watch a favorite show on the large flat-screen plasma TV or play charades. 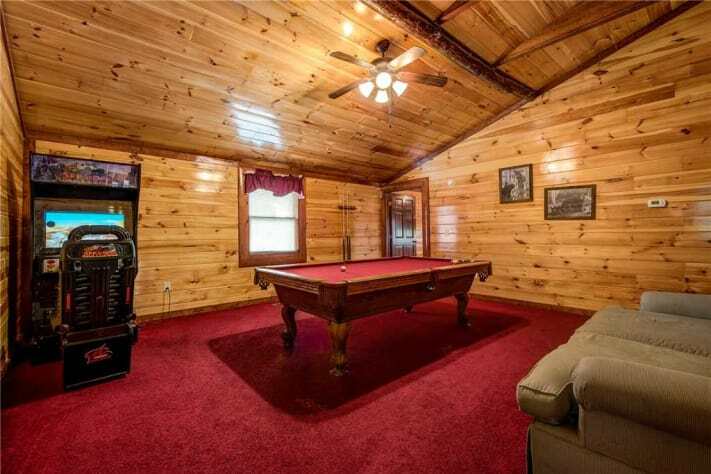 Just off the living room is the indoor pool. Large steps make it easy for just about everyone to access, and picture windows let you gaze out at the lush greenery while you splash about. What a treat to be able to swim even if there’s snow on the ground! 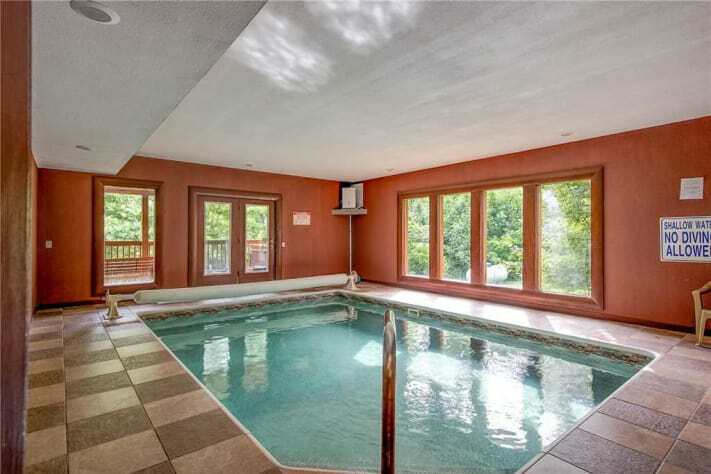 The room that houses the pool opens directly onto A New Beginning’s large deck. 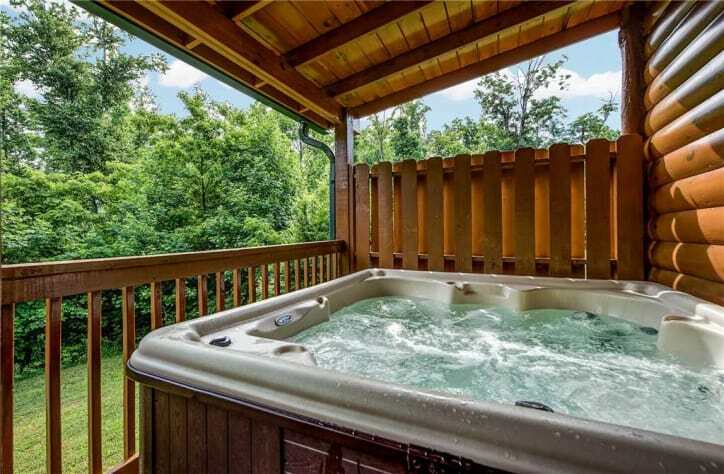 Dry off after your swim on a rocker, or follow up your laps with a soak in the deck’s hot tub. 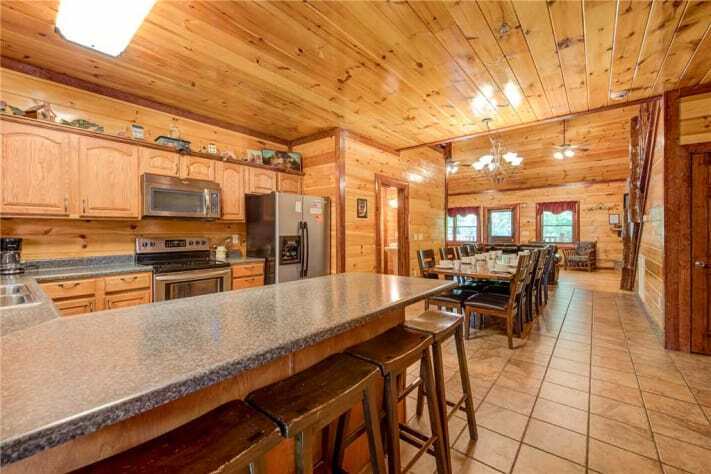 Also on the main floor are the kitchen and the dining room. 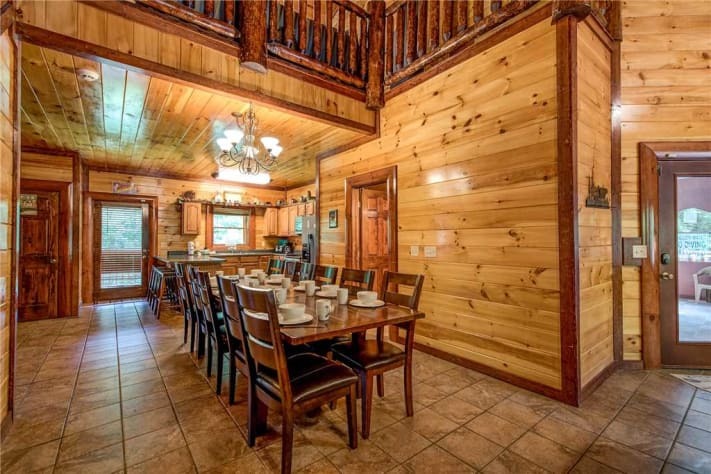 The table easily seats twelve, and there’s room for several more at the adjacent breakfast bar. 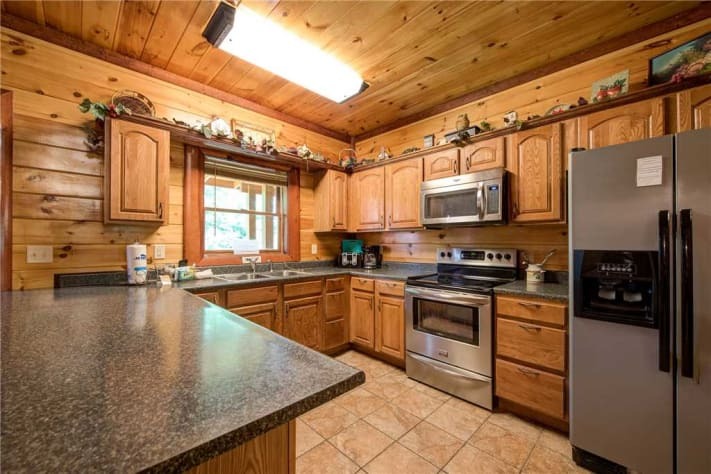 Open and bright, the kitchen is equipped with stainless-steel appliances, cookware, tableware, and generous counter space. The backyard has a charcoal grill as well, should you have a hankering for barbecue, along with a picnic table for alfresco dining. Upstairs you’ll find plenty of entertainment options. 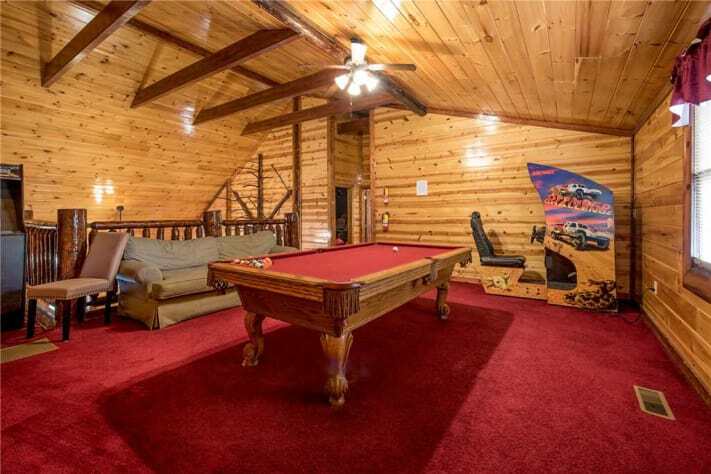 In the game room you can choose between shooting pool or playing at one of the two arcades: One is loaded with twenty-five games, while the other is an Off Road driving game. If even arcade games are too tiring for you after a day on the go, head to the home theater. 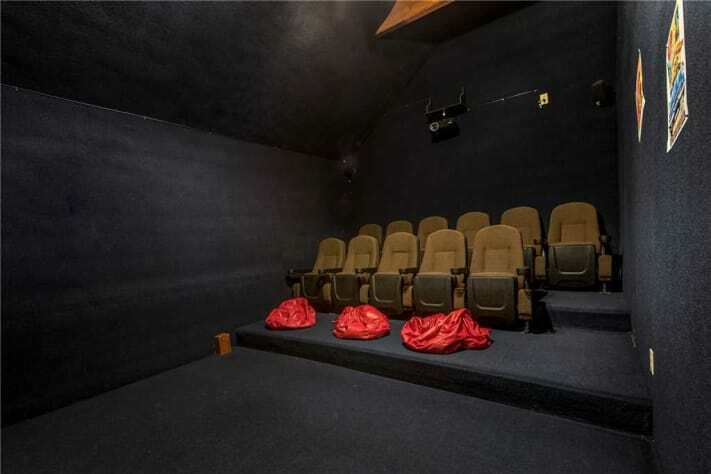 In addition to eleven cinema-style seats and additional space for the kids to sprawl out, this room has a large screen with surround sound. 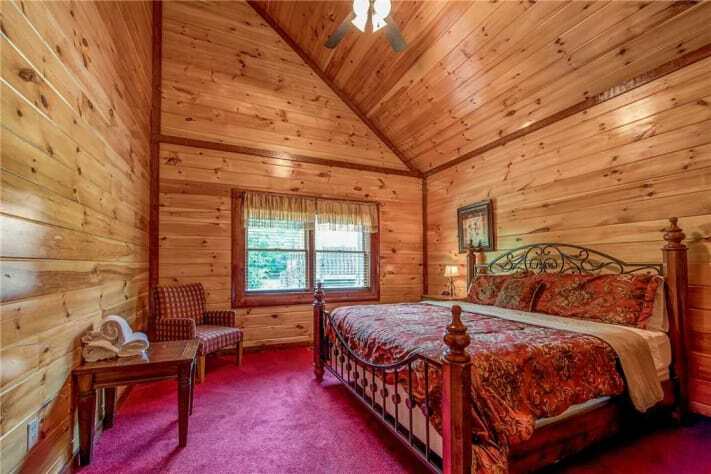 Four of A New Beginning’s five bedrooms are masters, with a king-size bed and classic, handsome furnishings. 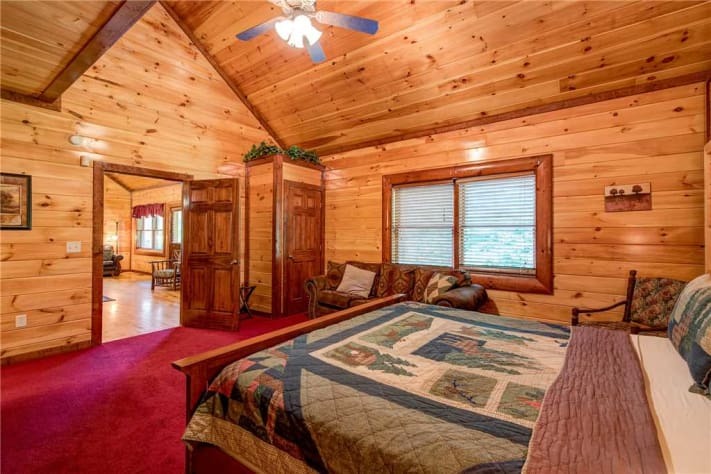 Two of those bedrooms are on the main floor. 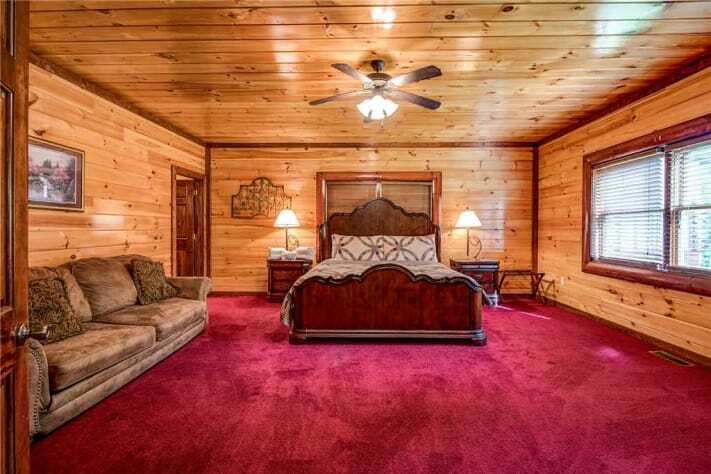 The other two master bedrooms are upstairs, as is the fifth bedroom. 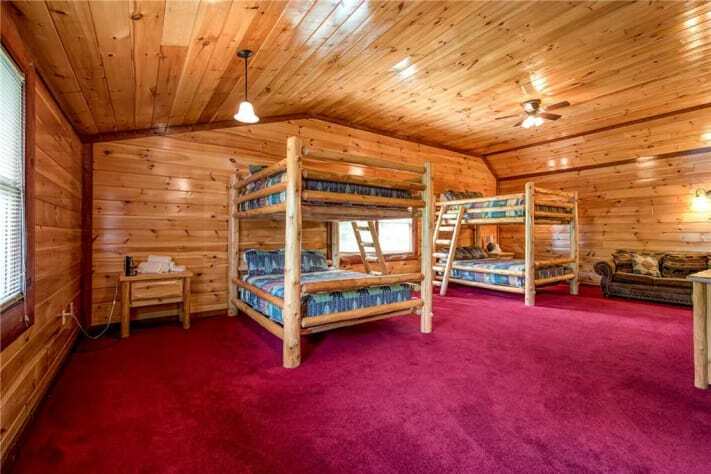 Furnished with a pair of queen-size bunk beds, this bedroom can sleep as many as eight people. 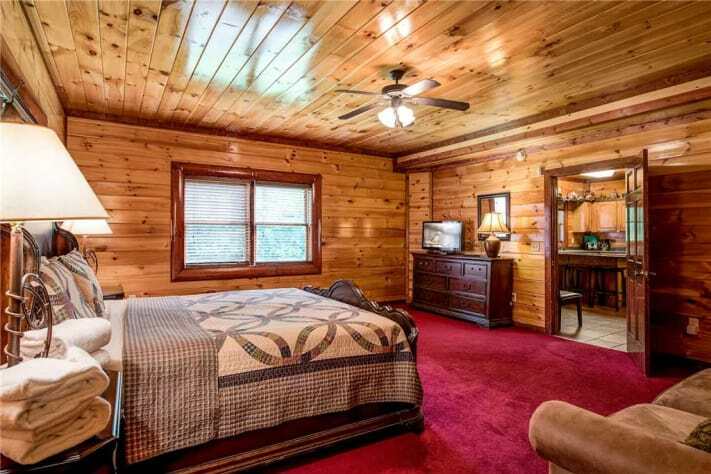 Each bedroom has a TV, ample storage, and plenty of space to stretch out. 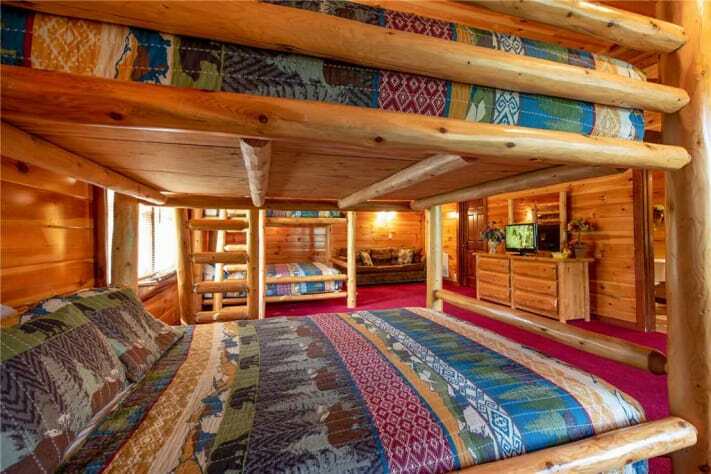 In addition, the cabin has four sofa beds, each of which sleeps two. 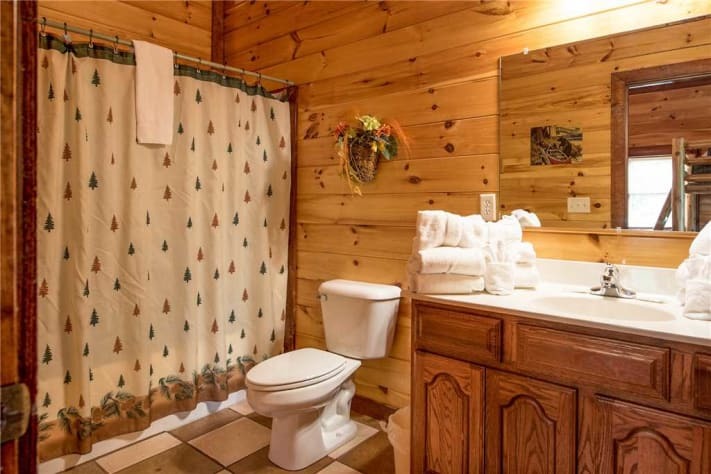 There are two bathrooms on each floor, as well as a half-bath conveniently located between the pool and the kitchen. 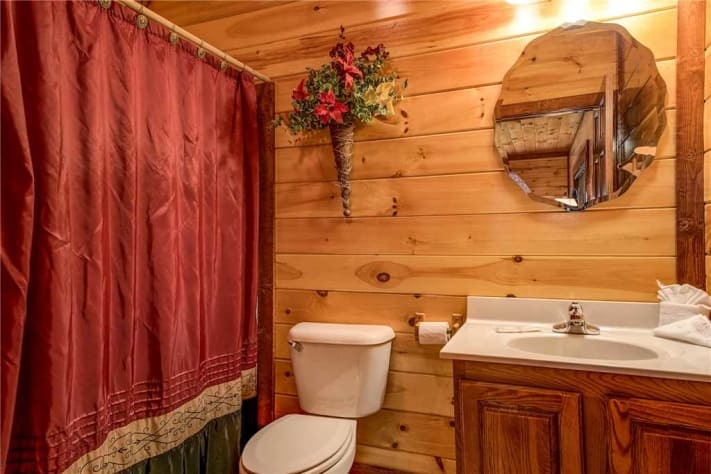 Other amenities include free WiFi, cable TV, a washer and dryer, and a driveway that can accommodate up to eight vehicles. 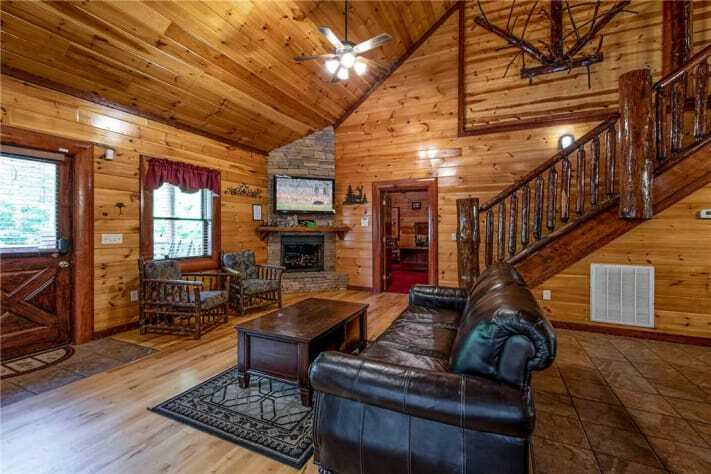 If you’re visiting the Smoky Mountains to hike, bike, fish, and enjoy other outdoor pursuits, A New Beginning is for you. 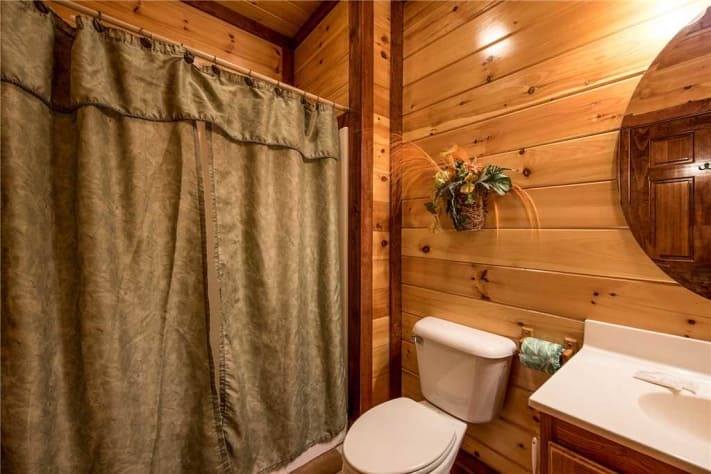 The five-bedroom cabin, which sleeps twenty people, is located in the Cosby section of the Great Smoky Mountains National Park. A favorite area of locals but off the beaten track, this section of the park is home to hiking trails and waterfalls. At the same time, A New Beginning offers a number of luxuries, including a private indoor pool and a spacious home theater. With its numerous entertainment options, A New Beginning is a destination in and of itself. 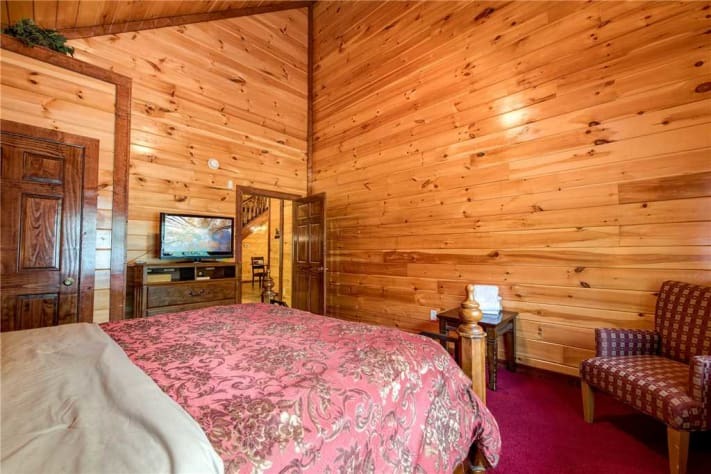 You could happily spend your entire stay in the cabin swimming, enjoying private screenings, shooting pool, and playing arcade games. 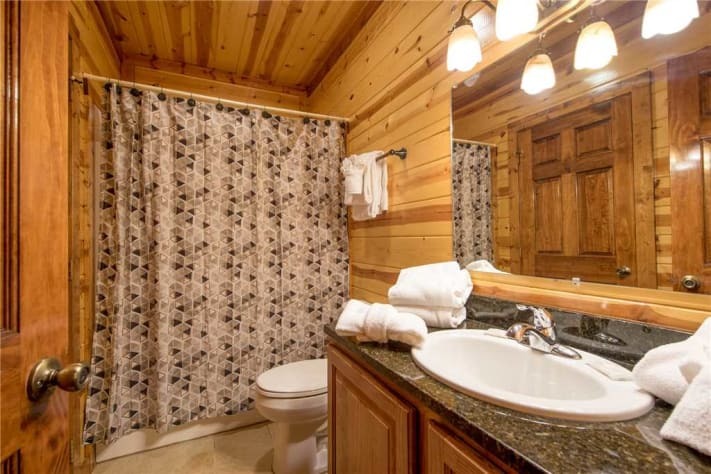 But the cabin’s spectacular location within the Great Smoky Mountains National Park, close to several of its loveliest trails, is perhaps its most exceptional feature. The Gabes Mountain Trail will take you to the ninety-foot-high Hen Wallow Falls; a spur of the Lower Mount Cammerer Trail will lead you to the Sutton Ridge Overlook, which offers spectacular views. Also nearby is Cosby Creek, where you can fish for brook and rainbow trout. As well as being one of the least busy sections of the park, Cosby is awash in wildflowers in March and April and offers a kaleidoscope of foliage come autumn. 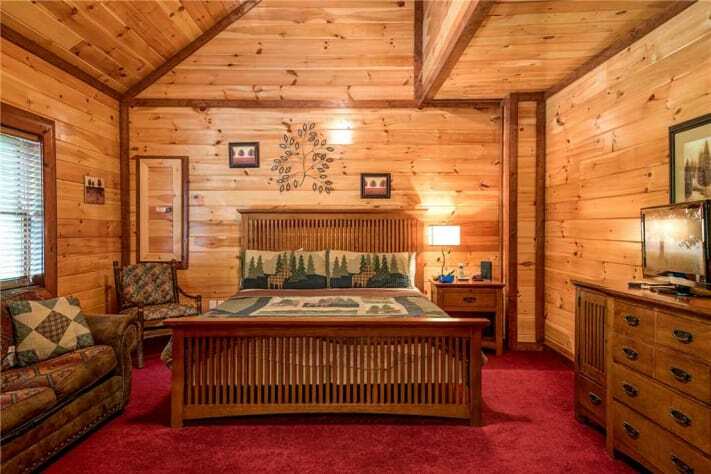 A stay at A New Beginning offers something for nature-lovers and luxury-lovers alike. Experience it for yourself; book your stay today! Please remember that Gatlinburg and the surrounding area is a mountain town with snow and icy conditions during the winter. Inclement weather can affect driving and parking conditions regardless of the property, driveway, or roads. We strongly recommend four-wheel drive and/or chains during the winter months.